Here I’d first like to acknowledge Sid Myer, Group Chairman of Asialink and the Asia Society – and of course a leader in philanthropy in Australia – along with Jenny McGregor, Asialink and the Asia Society’s Group CEO. Richard Woolcott, Founding Director, Asia Society AustralAsia Centre, one of this country’s most eminent diplomats. Professor Glynn Davis, Vice Chancellor of the University of Melbourne. Professor Ross Garnaut, now Vice-Chancellor’s Fellow, University of Melbourne and who was “present at the creation” of the modern Australian economy. The Secretary of my own Department, Ian Watt and the Secretary of the Department of Foreign Affairs and Trade, Denis Richardson, two very trusted counsellors. Murray McLean, my former Ambassador to Japan. Good to see you again Murray, under less trying circumstances. John Brumby, a great Premier of Victoria and who remains a great friend. Robert Doyle, Melbourne’s Lord Mayor. And can I particularly acknowledge my old colleague Gareth Evans. Now the Chancellor of the Australian National University – and who in a past life set the mould for great Labor foreign policy in a great Labor Government. Friends, the work of Asialink – promoting public understanding, providing information and training, building professional networks – only mirrors the good work done by the many people I see here today. Not only the distinguished guests who’ve joined us, but by the great variety of Australians in our audience, joined by visitors and friends from overseas. Reflecting the deep engagement of our people in our region. And reflecting Asialink’s vital mission, working with business, government, philanthropic and cultural partners to initiate and strengthen Australia-Asia engagement. And given the deep and educated engagement in our region which all of you here represent, I know that the great phases of the Asian story – the curves of the arc of our region’s rise – are more than familiar to you as well. Two decades of rapid post-war growth and industrialisation in Japan – from the ashes of 1945 to be the world’s second largest economy in 1968. Then the years in which South Korea and Singapore, Hong Kong and Taiwan emerged as the ‘Asian tigers’. Next Malaysia, Thailand, Indonesia and Vietnam opening their markets and pursuing export-led growth. And now – the dramatic emergence of China and India – defining our new century in entirely new terms. You’re also more than familiar with the sheer scale of that story as well. Not just the absolute scale, but the scale in the world as well – the way the changes have accelerated – the extent to which China and India are increasingly to the fore. As recently as 1990, the Australian economy was larger than the ten economies of ASEAN combined. Today, we’re about two-thirds the size of ASEAN’s economies in market exchange rate terms. On the eve of Australia’s long run of economic growth, before our two decades of reform-driven prosperity, ours and China’s were economies of roughly comparable size in market exchange rate terms. Now, remember Australia’s been growing for twenty years since and yet on the same basis China’s economy is today close to four and half times bigger than ours. In twenty years, China and India have grown so fast they’ve almost tripled their share of the global economy – and increased their absolute economic size almost nine-fold. Just two countries, which have grown from less than a tenth of the global economy to almost a fifth, in just two decades – and which, over the next two decades, are projected to grow from a fifth to a third. This incredible economic growth in our region is driving economic and strategic change in our world too. Asia has never been of greater global significance and as global economic and strategic weight shifts from west to east, global institutional frameworks reflect this in turn. With no better example than the emergence of the G20 as the global economic forum proper, one where Asia has its proper seat. The existing habits of co-operation within our region are becoming deeper. New institutions have emerged and new issues are discussed at them. And a new shape of interconnections is emerging too. Creating friendships and partnerships considered unlikely in the recent past, as rivals and even former foes combine to drive regional change in areas as diverse as girls’ education, climate change mitigation and capacity-building through aid. These are changes of type, not of degree. I summarise our new strategic environment as simply as this. Australia hasn’t been here before. Here, with our largest export market and largest trading partner neither a democracy nor part of our alliance system, a nation whose economic transformation is in turn transforming the economic and strategic balance of our world. Here, with an English-speaking democracy with 1.2 billion citizens, rising to find its place in the world and our region and on an ocean whose shores we share. Here, with the world’s largest Islamic population living in the world’s third largest democracy, one remarkable and too little remarked-upon country, every day disproving the millions of words spent arguing that Islam and democracy are incompatible. Here where new powers are rising and where power relativities are changing too. Now, it’s certainly true that the United States’ absolute lead in military power will remain clear for some time to come. And those who underestimate the power of the American economy to innovate and adapt are very mistaken. There is always someone predicting the eclipse of America – they’re yet to be proven right. So too with the strength of our friend and partner, Japan. By any measure, a major power, the third largest economy in the world with industry synonymous with quality and innovation. Yet for all the strength and resilience of Japan and the US, we are now seeing the most profound rebalancing of global wealth and power in the period since the United States emerged as a major power in the world. Just one illustration of that shift: the emerging and developing world could well be a net foreign investor, while developed countries become net foreign borrowers, as early as 2025. While so much is new, many old tensions remain – and the classical world of inter-state rivalries never really went away. With no better example than the Korean peninsula. Where a Republic whose friendship Australia greatly values, at once prospers with a free future and remains threatened by its neighbour. A rogue state which is a threat to its near neighbours, to the region as whole – and to its own captive people above all. Australia, like every country in our region, is touched by the changes. And the changes touch some of the most central elements of our national policies. So for example, much is written on the potential tensions inherent in our economic relationship with China and our Alliance ties. I’m a decision-maker, not a commentator, and I don’t by nature reach for the jawbone or the megaphone. But I do say this: The Government’s approach comprehends the challenges and risks. Certainly, these relationships will not manage themselves and we are far from complacent about them. But we are far from pessimistic too. Because there is nothing in our Alliance relationship with the United States which seeks to contain China, because a growing, successful China is in the interest of every country in the region, including our own and because our national strength, and that of our ally, is respected in the region and the world. I have no doubt: We can stand strongly in our changing region. Standing as a mature and confident power. Strong in the Asian century – with an ally in Washington and respect in Beijing. For our nation and our people, the implications of this Asian century are profound. It brings strategic, social, even environmental challenges. But for Australia, the economic opportunities are how the Asian century begins. The historic boom in mining investment in the Australian economy is fuelled by Asian demand. The increase in commodity prices has lifted our terms of trade to a 140-year high. Driving the biggest resources boom since the 1850s gold rush. Since 2004, mining investment has increased fivefold. Just this week, Chevron gave final investment approval to the $29 billion Wheatstone liquefied natural gas development in the Pilbara in our north-west. It’s the fourth multi-billion dollar gas project to gain investment approval in Australia just this year. Each of them, single projects which over their life attract a scale of investment equal to that of whole industrial sectors in some years. But there are real challenges in managing the investment boom’s effects on the economy. The patchwork pressures are very real. It is remarkable that in an economy as developed and diverse as ours, four big mining companies and four big banks could generate seventy five percent of reported pre-tax profits of our largest fifty firms in the last twelve months. Seventy five percent of profit – ninety nine per cent of profit growth. An extraordinary illustration of the challenges we face, where some parts of the economy are strained by growth while others risk being left behind. Above all, through the pressures created by our strong dollar, driven in turn by high commodity prices and high terms of trade. Parity with the US dollar late last year was a first since the 1983 float – and now for the foreseeable future, a strong Australian dollar is a new status quo. A strong dollar, making it harder for our exporters to compete in the markets of the world – while mining’s hunger for equipment and workers can also raise costs and make it harder for these non-mining sectors to compete for resources at home. We’ve made plans to meet these challenges – we have an ambitious agenda to modernise the Australian economy. Investments in skills, so Australian industry can climb the value chain and compete on quality not cost. Tax reform, using our resource wealth to fund company tax cuts across the board and build our pool of national savings. Technology investment, especially in high speed broadband, allowing every business in the country to do business more cheaply and more quickly. Transforming our economy for a clean energy future, with a price signal to deliver change and innovation at the lowest economic cost. And practical steps to ease patchwork pressures, like streamlining visa processing arrangements for Australian universities and strengthening the anti-dumping regime for firms facing unfair competition from overseas. But these are only the challenges of the present. 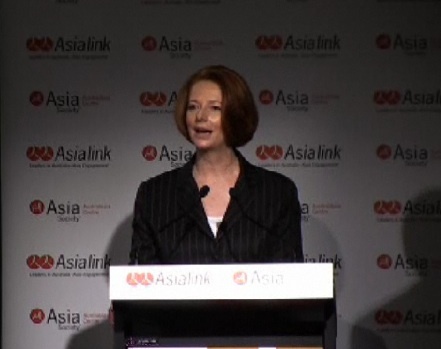 We know that Asian demand creates historic change in Australia and historic opportunities as well. In the Asian century, what used to be considered our traditional disadvantages – our reliance on natural resources, our location in the world – become great new strengths. For much of the post-war period, we were seen as an ‘old’ economy. Overly dominated by primary industry, overly reliant on extraction for export, through a long period when commodity prices were on a steady but continuous decline. But since 1970, close to four hundred million Chinese have moved to cities, with another two or even three hundred million expected to do the same in the next twenty years. Now urbanisation may be an elegant, Latinate noun, but it describes a muscular, industrial reality. It doesn’t mean a person moving to a new town, it means a nation building new cities. And you don’t build cities without commodities – without, for example, a lot of iron and coal. A typical Chinese apartment needs six tonnes of steel. A kilometre of railway needs about seven and a half thousand tonnes. Each tonne of steel needs more than one and a half tonnes of iron ore and more than half a tonne of coking coal. Australia has plenty of both and we are reaping the benefits accordingly. No longer an old economy and no longer subjects of the ‘tyranny of distance’ either. Asia has turned this on its head, giving us what The Economist has neatly termed ‘the advantage of adjacency’. For the first time, we are closer to the fastest growing and most economically dynamic region of the world than our competitors. This drives new investment patterns here. Twenty four years ago, the government of China committed to invest in the Mt Channar iron ore deposit in Western Australia, the first major mining investment outside China. By 1990, Chinese investment in Australian had reached $1 billion in today’s dollars and from that low base has increased almost tenfold in twenty years. And it drives new advantages in trade as well. The sailing time from the Pilbara to Qingdao in China is just 11 days – it’s 35 days from Brazil. And it is not only in natural resources where we stand to be beneficiaries of our adjacency to Asian growth. Yes, Asian growth and Asian demand is driving a rise in the dollar and the rise in our terms of trade which put sectors under pressure. Education, tourism, parts of retail, manufacturing in particular. But while Asian growth is creating new conditions, new competition, it is creating the future demand as well. Because yes, the new Asian middle class lives in apartments and catches urban trains built on our coal and iron. They’ll fill those apartments with high-end manufactured goods, dine on clean, high quality produce and drink premium wine. They’ll look to countries like Australia for tertiary educations and for technical skills, they’ll travel in new ways, seeking new custom-made holiday experiences, not the package tours of former years and through life they’ll want sophisticated financial advice and the benefits of the world’s best medical services as well. And in doing all this, the new Asian middle class will give Australia an opportunity to make our whole economy strong. The challenges for Australia are significant, the structural adjustments forced on us are real. The economic opportunities are enormous as well. The Asian century has begun and my Government is leading Australia through its challenges and towards its opportunities now. Investments and reforms to keep the whole economy strong. Easing patchwork pressures, creating jobs and spreading opportunity, so no person and no place is left behind. And pursuing our interests in the world. That means maintaining economic openness. The key to growth in the region and jobs at home – working in the G20 to deal with structural imbalances, at APEC to open the region as a whole, alongside a Free Trade Agreements agenda to deepen country-to-country economic ties. It means developing effective regionalism. Groups with the right membership and mandate to address the full range of security, political and economic issues facing the region. We’ve got the EAS off the starting blocks now but there’s a long race ahead. It means maintaining strong bilateral relations with our key regional partners. Strengthening new relationships while nurturing existing ones. It means a strong Australia-United States Alliance. A continuing, strong stabilising role for the United States in our region, the vital role it has played now for sixty years. It means a strong defence force to reinforce Australia’s strategic influence, founded on the principle of self-reliance. Delivering the significant new capabilities developed through the Force 2030 White Paper. These are the things we do now, the things we must do. They are the usual business of government – but in the Asian century, business as usual is not enough. Because what we know clearly is there isn't a single aspect of government policies and national planning that won't be touched by the great changes to come. Food security and foreign investment, immigration and education, stock market structures and financial regulation, energy policy and environmental standards. This is a vast landscape of change. Some parts of this landscape we can see already, and the challenge there is to set our course, while some parts are uncharted still. Now, perhaps that is no surprise. The growth and change in Asia is something really new, to adapt an expression from another century, this is a change of “world-historical” significance. When Great Britain industrialised, it took seventy years – the whole period from 1830 to 1900 – for its economy to quadruple. I’m Welsh, by birth, and the things that happened for good and ill in that industrialisation are the mythology of my own family and are marked in the families of millions. It was an industrial revolution which changed almost everything. It redrew the map of Africa and painted half the atlas pink. It created industrial politics and Labor Parties and defined the essential outlines of the democratic structures we live with today. It remade private life, changing everything from the shape of the family home and the layout of cities to the experience of childhood and what it meant to be a woman. Now that happened when the economy of Great Britain, a nation of millions, grew by a factor of four over seventy years. In the last twenty five years the economy of China, a nation of 1.3 billion, has grown by a factor of twenty. Already the world’s largest manufacturer, the world’s largest exporter, the world’s largest consumer of energy, already the world’s second largest economy, on some projections, on track to be the world’s largest in twenty years. And India is rising too. Set to surpass the US economy for size by mid-century in purchasing power terms. At these rates, China doubling the size of its economy every eight years ... India every eleven years and Indonesia every fifteen. Enormous economic changes – human changes too – creating enormous human opportunity. Millions of people leaving absolute poverty absolutely behind. While Asia now has a large and rapidly growing middle class. Within a few years, it will be bigger than that of the rest of the world combined, North America and Europe included. China is already the world’s largest consumer market for automobiles and for computers – not the largest maker, the largest buyer. With the world’s greatest number of internet users and the most users of mobile phones as well. Now when a person first gets a car, a computer and a mobile phone, it changes their life. When hundreds of millions of people first get these things, it changes the world. As I recall the histories I read as a child, I can’t put aside this thought: chapters of great change often seemed to open with the words “the middle classes were rising”. This rapid growth in much of Asia will change the social and economic, strategic and environmental order of our world. And while Asia’s rise has been with us for a lifetime, China and India remain relatively poor countries in per capita terms, with decades of growth ahead. These changes have barely begun – these changes will define our future. That is why I announce today that the Government has commissioned a White Paper on Australia in the Asian Century. To ask and answer the great national questions through this period of great national change. There will be plenty of hard questions – and not all of them will have easy answers. We have asked one of Australia’s finest public servants, Dr Ken Henry, to lead work on the preparation of this White Paper. The task we have set Dr Henry and his team is substantial. There is the intellectual task of the White Paper itself: fully to comprehend the implications of the Asian century, fully to describe its opportunities and risks. There is the public task of the process of its development and discussion: to ensure these implications are understood in every part of our nation. And there is the task to set the pattern for more work over time. Providing the analysis and understanding which will ensure that every part of Government is working with the same approach. Offering the information and advice which allows every part of our business community to make the most of their ability to prosper and profit in this new world. The Asian century ideas which define a financial market reform or test the priority for an education investment. The Asian century approach which comprehends the economic and environmental context for getting the cleanest energy at the cheapest price to the customers who need it most. Naturally, I expect a person of Dr Henry’s policy credentials will offer some well defined and immediate insights – and that these will lead to some specific initiatives for implementation during this term of Government and the next. But the real aim is higher. The White Paper on Australia in the Asian Century should generate a set of general propositions to guide policy development over the long-term. To guide preparations over the next five years for major policies and projects which would become reality over the next ten to fifteen. This will be a thorough and traditional White Paper process. Formal terms of reference and details of the governance of the White Paper are being released today. The terms of reference are wide but it should be noted the White Paper will not review the decisions outlined in the Defence White Paper Force 2030. A new Defence White Paper is due in the first quarter of 2014 and preliminary planning for this is already underway. The terms of reference also reflect my view that we are not on a quest for more regional or indeed global architecture. Our challenge is to ensure new institutions like the G20 and the EAS have growing meaning and purpose. As my advisor, Dr Henry will lead work on the preparation of the White Paper. A Committee of Cabinet including external advisers will be established, supported by an appropriate Secretaries Committee to review progress. Dr Henry will be supported by an officials taskforce based in the Department of the Prime Minister and Cabinet with representation from the Treasury and the Department of Foreign Affairs and Trade and other agencies as required. The White Paper will include an intensive process of consultation with the Australian community, business, academia and international partners. A series of public consultation forums will be held and the process will call for submissions from interested parties. The White Paper will be considered by the full Cabinet in the first half of 2012 and released during the middle of the year. The White Paper on Australia in the Asian Century will make a major contribution to public debate and establish major new directions for public policy. A national blueprint for a time of national change. Change isn’t easy, change has never been easy. But Australians always make change work for us, turning our creativity and co-operation to the task. We truly are already a decade into an Asian century. A great future is there for us – there for us if we understand and explain these great changes – there for us if we make great decisions as well. Not because change is always good – but because Australia is always good enough to make the best of change. And Australians should be determined. Because the prize is rich indeed. A peaceful, open, rules-based Asian system. Effective regional institutions, respect for all countries of the region, large and small. Space for a rising China. A robust alliance between Australia and the United States. That is the Asian future we seek in the Asian future we face. That is the task, one together we share. To build a great future for our own great nation.